RALPH'S MYSTERY SOLVED-AT LAST?! Retirement beckons for Midway's oldest, crankiest Homicide detective! But before Klem can hang up her space boots, there's one final case to solve-and it will hit closer to home for her secretive young partner Ralph than he'd like, when what begins as a simple murder case soon entangles the detectives in a deadly terror plot! Ralph's secret mission is about to explode�and no one will escape unscathed! 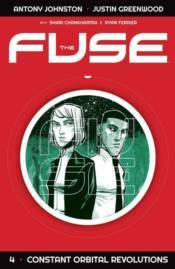 Collects THE FUSE #19-24.